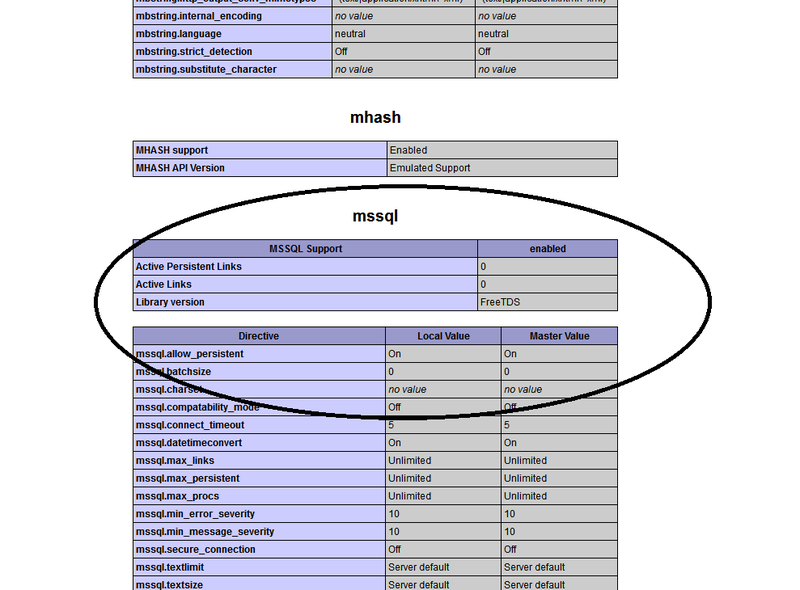 In this post we will connect Php code in Linux env (Debian 8 Jessie) to M$ Sql Server, using FreeTDS (latest vers.). We start from a fresh installation of Debian 8 Jessie. Now if all works fine you can continue. Add on a new line the following and then save. Now for the best check you can restart the server and read the boot log to detect eventually error and warning. To check that Php5 and Apache2 “speak each others” and to verify the current running version create in /var/www/ a file named test.php, and insert this single line. Open your web browser and type the url: http://<ip server>/test.php. If you will see a table like in then next fig all works fine ! Now you can verify a real code that submit a query e return a result. If something goes wrong you can verify if the server can connect to Sql Server. You can check sql server connection using command line. tsql command must be retun the 1> prompt, where you can submit query. Att: Some notes related to the instance of Sql Server that we want to use with freetds. – The instance must be accept Sql Server authentication. – The instance must be a default instance, otherwise (in case of named instance you need to fix the the used ip port by Sql Server modifing the config file/etc/freetds/freetds.conf accordingly). In this post I preferred to use the latest version of freetds and therefore I had to recompile everything. You can use a more old version of freetds and in this case the procedure is more simple. You can check freetds version using tsql. This entry was posted in Development, Linux and tagged Debian, development, freetds, Linux, php by Giampaolo Tucci. Bookmark the permalink.